The last two years have been a bit of a whirlwind for Sound of The Sirens. Over that period, Abbe Martin and Hannah Wood have risen irresistibly out of the local and support slot circuit to playing major festivals and headlining their own tours. They’ve won many supporters along the way with their superbly-crafted songs, beautiful harmonies and exhilarating live performances. All that’s missing so far is the chance to convert that to national airplay. “For All Our Sins” should be the chance to put that right. The opening of the first song, the lead track “Smokescreen” is a good indicator of the new approach with the addition of bass and drums and some Spanish style nylon-strung guitar and percussion giving the song an added dimension. It’s not so much a move away from their live sound as a subtle augmentation. The arrangement reminds me of the way Al Stewart was produced in the mid-seventies, an he’s still being played on commercial radio forty years later. Hannah and Abbe’s voices and instruments are still right up there in the mix, but the addition of some more daytime radio-friendly instruments and a few hooks have certainly worked. Jeremy Vine thinks so; he was at the album launch a couple of weeks ago and played the song on his Radio 2 show the following day. That’s a pretty impressive flash-to-bang time. There are a couple of songs that have been reworked for the album, and it’s interesting to compare the originals with the new versions. Both “Together Alone” and “In This Time” have been smoothed out a little, with the vocals coming down a couple of notches to blend better with the other instruments, and some slight structural changes. Using a drummer has made the transitions between sections smoother, particularly when the tempo changes, and the production team has introduced some studio effects (some dub echo in “Together Alone”) and even created a psychedelic vibe with the ambient sounds, echo, and reverb of “The Circus”. But all of the studio wizardry’s just window dressing if the raw material isn’t right. Abbe and Hannah’s songwriting is a huge part of their appeal. They write with a darkly poetic romanticism about subjects that are important; mental health in “The Voices”, the impermanence of relationships in “In This Time” and maybe even embittered journalists (amongst other things) in “Smokescreen”. They often explore the elemental side of human experience (“Chaos”) but there’s usually a message of empowerment in there as well. They care passionately about what they do. 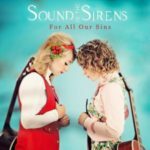 With “For All Our Sins”, Sound of the Sirens have succeeded in creating studio versions of their powerful and dynamic songs for mainstream consumption without losing the creative fire in the process. The songs will be there on their upcoming tour and during the festival season in all their dynamic and noisy glory but, for now, this sounds like the next step up the ladder. “For All Our Sins” is released on DMF on 26 May 2017.